Biggest strength in 2016: Battlers until the end of the season, Holy Cross navigated a strange schedule to finish above .500, but more importantly winning four of their last five games. After losing a closer-than-it-looked 31-14 loss to Colgate in Week 3, Tom Gilmore’s team was behind the eight ball most of the year but still managed to finish the year strong. The fruits of those battles last year could be what propels them to success in the early going in 2016. Biggest Challenge In 2016: The Crusaders had some real gems last season – like their 37-0 stomping of Albany of the CAA, or their 42-0 thrashing of Lafayette. But there were critical games where things never really got together (a 51-38 loss to Lehigh) or the Crusaders couldn’t close the deal (31-14 vs. Colgate, 47-41 overtime loss to Fordham). At their best, it looks like Holy Cross could beat anyone in the league. But there were just enough lapses last season to push them out of contention. Can they get the consistency together to win it all? Biggest Departures: He was only the No. 2 receiver last season, but WR Khalif Raymond had an outsized role on the Crusaders when you take into account total yards. The speedy wideout who is in camp for the Denver Broncos had 978 yards receiving, 20 yards rushing and 335 yards in kickoff returns, giving him an average of over 140 all-purpose yards per game. That’s a lot of offense to lose to the NFL. Players To Watch: QB Peter Pujals came into the Patriot League as a freshman, and almost immediately started to build his legend with a near-win over Harvard. By 2015, he led the Patriot League in passing yards with 3,195 and threw a career-high 28 touchdown passes. This summer, he was a camp counselor at the Manning Passing academy, rubbing shoulders with NFL greats. He has an awful lot of accolades at Holy Cross – but the one award that has eluded him is one that reads “Patriot League champion.” In his senior season, Pujals is poised to make that final step, with veterans returning like RB Gabe Guild, WR Brendan Flaherty, and TE Lucas Nikolaisen. Will he? Holy Cross has a pretty decent defense, too. DE Dewayne Cameron (47 tackles, 8 sacks) has been a disruptor on the defensive line and a guy whom opposing offenses need to key on and contain. His pass rush is a key ingredient to Holy Cross’ success on defense. Biggest Game: vs. Fordham at Yankee Stadium, 11/12/2016. It was tempting to put their rematch with Lehigh at home on October 22nd here, but it’s very possible that this game vs. Fordham, played for the inaugural “Ram/Crusader Cup” at Yankee Stadium, could be for the league title. If the 150th meeting of Lehigh and Lafayette was any indication – which was played at Yankee Stadium in 2014 – the Ram/Crusader Cup will be a big-time, bowl-like atmosphere, which will make this a great football game. Adding to the flavor is the thought that this might be a revenge game for the 47-41 overtime loss on 2015 – the perfect ingredient to add to the punch for Holy Cross fans. 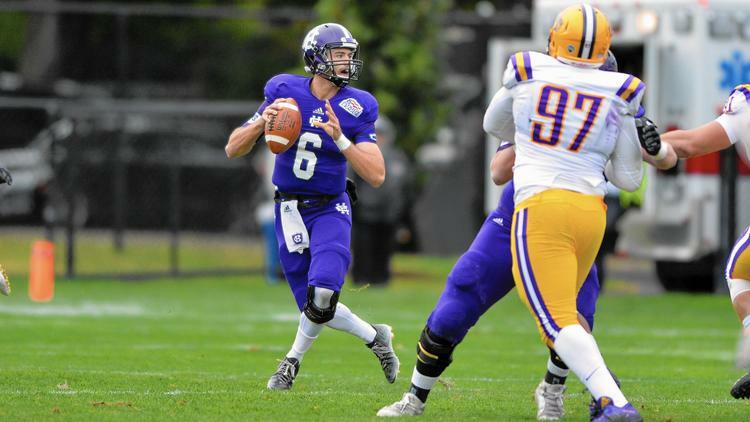 Holy Cross In Two Sentences: With the best quarterback in the league under center, Holy Cross will have more than a puncher’s chance to win the Patriot League or an FCS playoff spot. But they’ll need to bring more consistency than they did last year to make it.